Are You Meeting the Policy Guidelines for Food Safety when it Comes to Food from Outside Sources? 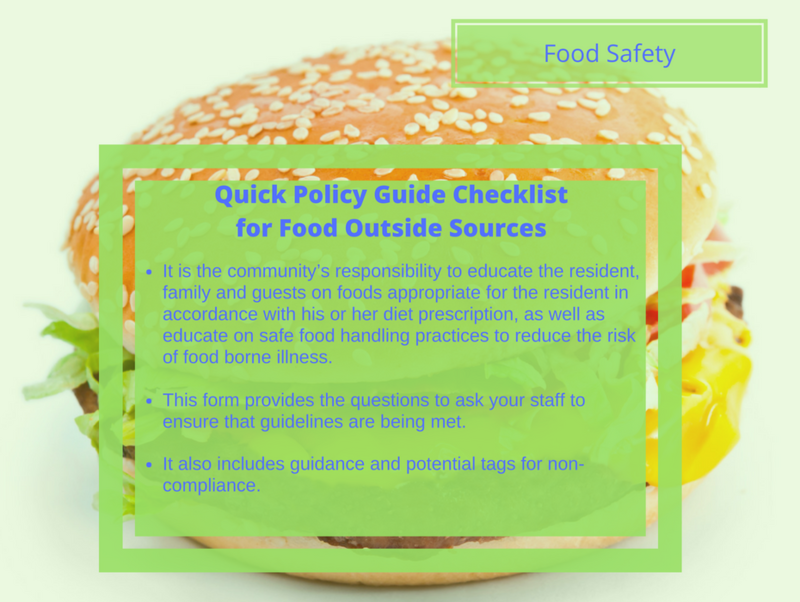 Find out if your staff is meeting the food safety requirements using this condensed guide to see if you are meeting the guidelines for your community when it comes to safely bringing in food from outside sources. Our Mission at BSN Solutions is assisting long-term care communities to enhance older adults’ dignity, happiness, and health through pleasant, meaningful dining experiences. Our Goal Allowing individuals greater freedom to decide when, where, and what they will eat which leads to more independence and improved health outcomes. Our Products Our products were developed by a consulting team of a licensed administrator, registered dietitians, diet technicians, and a certified dietary manager who are all highly experienced in long-term care. Our products are all about helping seniors remain independent by implementing the concept of culture change and Resident-Directed Dining Experiences. For three decades, these values and practices have been the core of our company. Our Mission is assisting LTC communities to enhance older adults’ dignity, happiness, and health through pleasant, meaningful dining experiences. We want individuals to have greater freedom to decide when, where, and what they will eat which leads to more independence and improved health outcomes. That’s the goal of all our documentation and information tools we have available in our store.